- Didn't go pick it up until around noon on tues.
- Didn't get to even open it until after midnight (so technically I didn't even play it on launch day) because I got my new sharp 52" LCD HDTV and spent most of the day setting that up (I'll be posting a lot more on this later). - DVD's were still securely in the package when I opened it. Discs were scratch free. - Finally got to finish the first level (playing on normal). Yeah the single player is a LOT prettier. Feels like good old halo. Radio chatter is too quiet in mission (I swear the Arbiter mumbles). There are only subtitles for the cut scenes. Frame rate feels 60fps even during heavy fire fights. I'm enjoying it so far. Pretty much what I expected. I'll have more impressions once I get to play it more. - Finished on normal!!! Found all the the gold and silver skulls. Found all the terminals. It took around 10-12 hrs. - Make sure you watch the real ending AFTER the credits. There is also a slightly longer ending if you finish it on legendary. Yeah I cheated and just watched it on youtube. 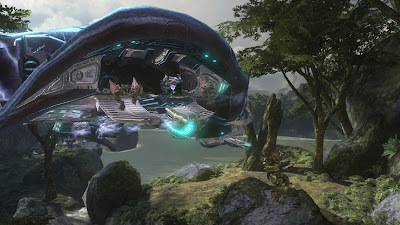 - Overall this was easily the best Halo single player yet. The levels overall are much better designed, great variety of environments, the pacing is a lot tighter, nice epic set piece battles, the story was much better, and the ending was pretty good too. Fantastic final level, not so good second to last level. - Probably has the best soundtrack out of the three. - There is still some repetition and back tracking but it isn't nearly has bad as the first two games. - I loved some of the vehicle levels. It needed more flying levels! - The replay thing is really cool letting you upload movies and screenshots to bungie.net. For the movies if you click to download one from bungie.net, then the next time you fire up halo 3 it will start to download to your console. They are pretty small to since it's like the old Doom replays. It just saves the player input and everything is rendered real time in engine when played back. Now I'm ready for some co-op, multiplayer, and forge.